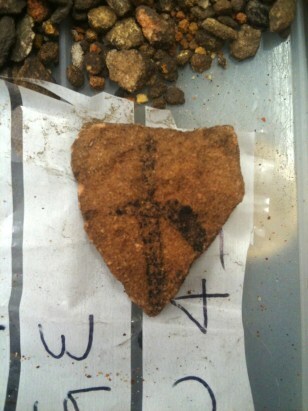 A fragment of Aboriginal rock art on granite found in Australian Outback is seen on a plastic bag. University of Southern Queensland archaeologist Bryce Barker said Monday, June 18, 2012 that tests show the Aboriginal rock art in the cave was made 28,000 years ago, making it the oldest in Australia and among the oldest in the world. The rock art was made with charcoal, so radiocarbon dating could be used to determine its age.